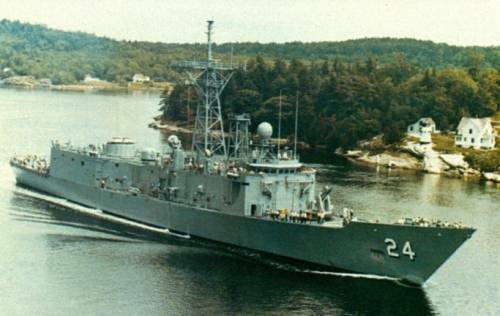 USS JACK WILLIAMS was the 16th ship in the OLIVER HAZARD PERRY class of guided missile frigates. The ship was homeported in Mayport, FL. 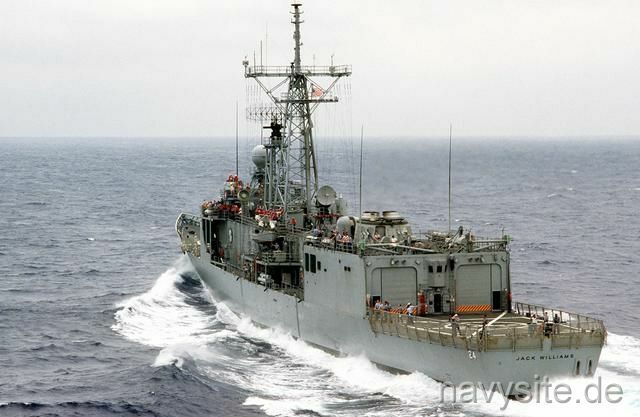 After decommissioning the frigate transfered to Bahrain on September 13, 1996, and was renamed SABHA. 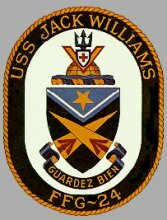 USS JACK WILLIAMS has been decorated many times, receiving the Combat Action Ribbon, the Joint Meritorious Award, the Meritorious Unit Commendation, three Battle Efficiency Awards, both the Navy and the Armed Forces Expeditionary Medals, the National Defense Service Medal, the Southwest Asia Service Medal with Bronze Star, two Humanitarian Service Medals, seven Sea Deployment Ribbons and the Kuwait Liberation Medal. This section contains the names of sailors who served aboard USS JACK WILLIAMS. It is no official listing but contains the names of sailors who submitted their information. Click here to see which USS JACK WILLIAMS memorabilia are currently for sale on ebay. Jack Williams, a U.S. Navy Pharmacist Mate, who served with the Marine Corps during World War II, carried forward this tradition. He participated in the Battle for Iwo Jima with the Fifth Marine Division, and died of multiple wounds, which he received while attempting to give medical aid to his fellow Marines. He gained his place on the honor roll of American battle heroes by going forward under intense enemy fire to assist a Marine who had been wounded in a grenade battle. He dragged the Marine to a shallow depression and, using his own body as a shield, administered first aid. Even though he was struck three times by enemy fire, he temporarily recovered and completed the task of administering aid to his fallen comrade before applying battle dressings to his own wounds. Still, he remained in the fire-swept area to care for yet another Marine casualty. Only then did he attempt to make it back to the rear area where he could have found more adequate aid for his own wounds. His efforts, however, were hampered by pain and profuse bleeding, making him an easy target for enemy sniper fire. 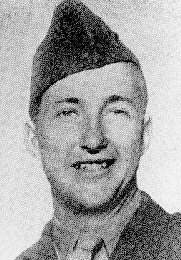 For his courage under enemy fire, he was posthumously awarded the Congressional Medal of Honor for "his courageous determination, unwavering fortitude and valiant performance of duty." He also was cited for being an "inspiring example of heroism in keeping with the highest traditions of the United States Naval Service." The light blue, the gold star, and white chevron allude to Pharmacist Mate Third Class Jack Williams who was awarded the Medal of Honor posthumously. The ship's mission is symbolized by the light and dark shades of blue, referring to day and night, sea and sky, and around-the-clock vigilance. The arrows are emblematic of the ship's weapons, and the piles represent the guidance systems. Together, they connote task force readiness. The trident, "V," and demi-globe on the wavy bar, refer to the Navy, the 5th Marine Division, and the assault on Iwo Jima during World War II. The shield emblazons the conspicuous gallantry of the non- combatant Pharmacist Mate Third Class Jack Williams, who gave his life for his country.